Music fans attending Galaxy Studio Live, a series of four live gigs sponsored by Samsung UK, are using NFC to store their tickets and make purchases at the venues with a tap of their mobile device. Tickets to the events can only be bought after winning a ballot. 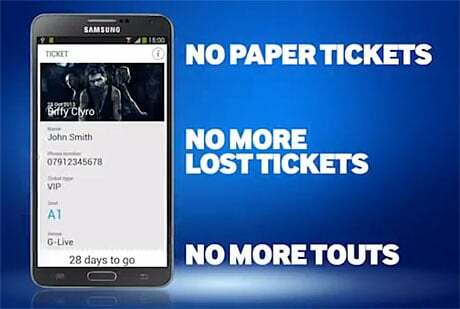 Winners receive an SMS and an email, containing a unique ID number and a link to Samsung’s Smart Ticket app. Once the app is downloaded, consumers enter their ID and mobile phone number and choose the artist they are going to see from an in-app list. They will then be able to view their secure Smart Ticket along with videos and information on the artist and venue as well as enter competitions and listen to the artist’s tracks on Soundcloud. Consumers can also choose to link their PayPal account to the app so that they can buy food, drink and merchandise by tapping their phone against NFC readers at the venue. Those without NFC smartphones will be sent an NFC sticker they can attach to the back of their smartphone to gain entry into the event and for making payments. The series kicked off with a Biffy Clyro concert at Guildford’s G Live venue in late October. The other three concerts include artists Laura Mvula in Chelsea, Bullet for my Valentine at Cambridge Junction in November and Bastille in December in Shepherd’s Bush. “Electronic concert ticketing is widely accepted as a great idea and, not least, as one of the means of tackling the much-publicised problems related to unregulated secondary ticketing,” says Brian Message, chairman of trade body the Music Managers Forum.